Based on a rugged ladder frame and powered by a 6-cylinder engine, the Toyota 4Runner offers true off-road capability, a spacious and comfortable cabin, and a good ride. For 2019, the Toyota 4Runner Limited adds a Nightshade Special Edition featuring black interior and exterior accents, as well as 20-inch black wheels. TRD Pro models now feature a JBL audio system, a moonroof, a TRD Roof Rack, a revised front skid plate, and an uprated suspension. 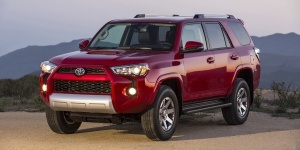 Get the best price for the Toyota 4Runner of your choice from a dealer in your area. Request a price quote now.